Oral health is an extension of your overall health. Each visit with our hygienist includes a thorough check of your gums to make sure they are healthy. We have a pain free approach to cleaning your teeth. We provide N2O gas, local anesthetic, desensitizing mouth rinse and a variety of other topical numbing techniques. Most of all, we are sensitive and gentle. Removing plaque and calculus (tartar build up) on your teeth (every 6 months or more frequently) prevents a bacteria festival causing decay or making gums red and sensitive. The cleaner your teeth are, the less sensitive the gums around them tend to be. Our hygienist, Tami, does a fabulous job educating patients and giving them the tools to maintain a whiter, cleaner smile. One of the most important steps you can take toward overall health is to have good oral hygiene. 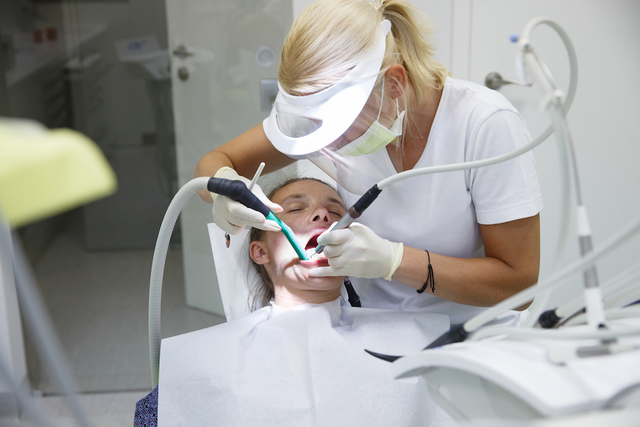 To maintain a healthy smile, we recommend two dental cleanings per year from a dental hygienist. You may need more if you have periodontal disease. We are committed to providing the best dental hygiene visit for you. Oral cancer screening, including checking lymph nodes. Record probe depths to help evaluate tissue health. Apply topical anesthetic or provide local anesthetic nerve block or N2O if desired. Scale teeth using an ultrasonic tipped instrument and hand instruments. We give you feedback and oral health education based on what we see in your mouth. Many of us think a dental exam is a quick 5 minute look in the mouth. An initial exam by Dr. Christopher Funk is much more. Then he reviews the radiographs….. This is not an all inclusive list, but names a few of the screenings you receive to “Protect and Perfect Your Smile”. This in depth approach may take a little longer, but we establish a base line of health status from the first visit to Funk Dental. Dr. Christopher Funk will offer his recommended treatment. Dr. Funk takes a conservative and practical approach keeping in mind the individual’s priorities for care. After all, you are in charge of your own oral health. We are just here to help! The Funk Dental team is consistently providing the care our patients have come to expect and appreciate and we are experts at this.